First woman. First to be tempted. First to sin. 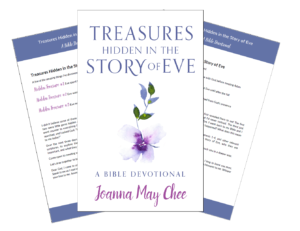 Plus sample chapters from the companion book Forever Loved: Eve’s Story: The Devotional Bible Study. A unique interpretation of a woman we all know. Even those that are not religious or have not read the bible, know who Eve is. The first woman, the woman that was tempted by a serpent and fruit. God created Eve, we know this, from Adam. But what we are to learn is Eve’s story and her fascinating account that is woven with details from the Bible and this delightful author’s engaging storytelling. Not only do we meet Eve but also we get a chance to hear the author’s own story and connection to this Biblical character. I really enjoyed Eve in this book and the moment we started her story I was hooked. I thought it was neat to see how the author shared a small detail from her life weaving into this tale and how it interconnected. This book’s cover is one that I positively adore. It is super pretty and I am a huge fan of purple. It called to me from the water painting style of the floral prints. I loved this book and the story behind it. It was fun to read, I felt as though I was learning details that I never took away from the Bible. Though it is a story woven with the author’s opinion, she did a nice job of finding the truth to keep with Eve. It is a book I would recommend and encourage you to read. To celebrate her tour, Joanna is giving away a grand prize of a signed copy of ‘Forever Loved: Eve’s Story’ plus $25 Amazon voucher! !Be sure to comment on the blog stops below for nine extra entries into the giveaway!Find out all the details and enter to WIN at Forever Loved: Eve’s Story Celebration Tour Giveaway.